I woke up a bit before 8:00 expecting to have a lazy morning and then head the short distance down to Fury Cove, a jumping off point for rounding Cape Caution. I listened to the weather forecast and quickly realized that today was the day to head around Cape Caution, since it looks like tomorrow will be much windier. After a few minutes of preparation and I was pulling up the anchor and heading out of Joe’s Bay, bound for the Broughton’s. Fitz Hugh Sound was glassy and the ocean swells built gradually as I headed south. A big fog bank looked to be just beyond Cape Calvert, and as I moved south I found myself right in it with visibility of just a few hundred yards. Normally fog is something I try to avoid, but in this case it was actually a good thing. Typically when there’s fog there isn’t much wind. 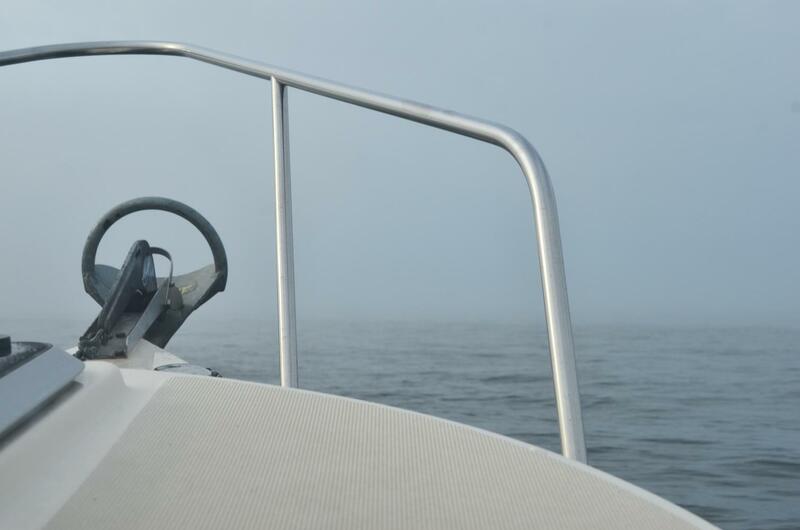 Radar and GPS make navigating in fog pretty easy, but no electronic toys can make windy weather more comfortable. 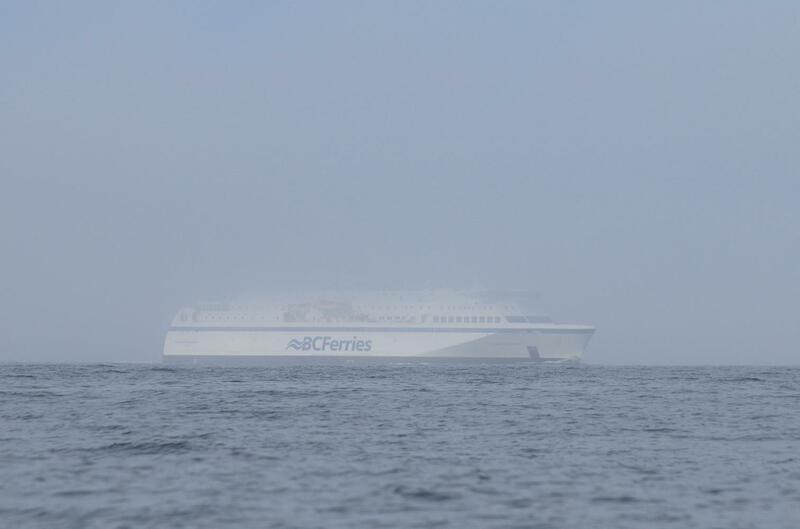 The fog began to lift as a neared this BC ferry. It's 3/4 mile away in the photo. 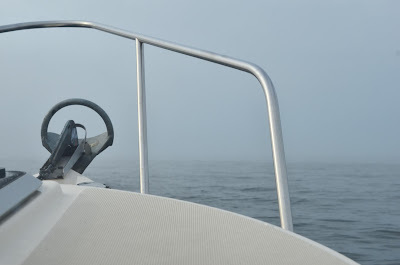 There were quite a few other boats rounding Cape Caution, at least according to my radar screen. The fog didn’t actually last that long, maybe five miles, and thankfully the wind didn’t fill in when the fog lifted. Overall a very easy rounding. The worst conditions were probably a one-foot chop and a four-to-five foot swell. Not as calm as the rounding on the trip north, but certainly not rough. The view entering Wells Passage and the Broughtons was spectacular. Maybe not quite as striking as some of the vistas further north, but impressive nonetheless. 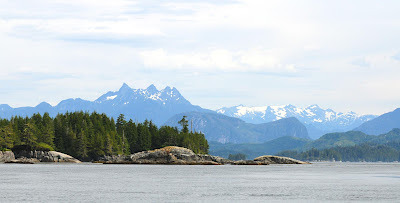 I didn’t have any real plan on where I was going in the Broughtons, but a fellow cruiser in Shearwater had suggested Jennis Bay in Drury Inlet. The timing to get through the narrows at the entrance to Drury Inlet was perfect, so I headed for Jennis Bay. The caretakers are super friendly and welcoming. There were only a couple other boats on the dock and the cabins are currently rented out to logging crews, but most people got together in the evening for drinks and conversation. Lots of, “You went to Alaska in that,” comment, which are kind of entertaining. For many people the Broughtons are as far north as they venture, but the truth is, getting past Cape Caution and then Dixon Entrance is not difficult in a small boat. It just takes a schedule flexible enough to wait for good weather. Living aboard and wandering the Pacific Northwest. Click here for my current location via SPOT. Click here for my current location via AIS.